I recently had the pleasure of enjoying a Kentucky Proud bourbon flight at Louisville’s Down One Bourbon Bar. Down One is quickly becoming a main attraction on the bourbon scene. The food is amazing, the bourbon selection rivals that of Silks Jockey Lounge in the adjoining Galt House Hotel, and the bartenders know their stuff. Thanks to the staff for providing us with much of the information found in this article! The flight that we snagged featured Wild Turkey Kentucky Spirit, Kentucky Vintage, and Pure Kentucky XO bourbons for $15. While we have reviewed Wild Turkey Kentucky Spirit here before, grabbing a flight gave me the opportunity to put Kentucky Vintage and Pure Kentucky side by side for the first time. 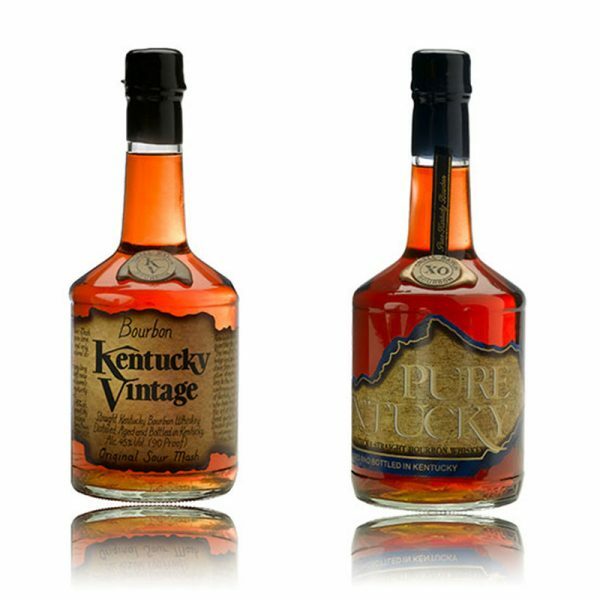 Both Pure Kentucky Small Batch bourbon and Kentucky Vintage are brands owned by Kentucky Bourbon Distillers. While neither bottle had an age statement that I saw, KBD claims that Kentucky Vintage is older than 10 years old – “long beyond that of any ordinary bourbon”, according to the label. Older bottles had 18 years as their age statements as late as 2001. Pure Kentucky hasn’t had an age statement on the bottle for the past 8 years, and for some time it was rumored that the bourbon was to be discontinued. Perhaps blending the whiskey with different aged barrels was a viable alternative to just scrapping the brand altogether. Truth is, we don’t know how old either bourbon really is, or what the ages of the blended barrels are. If anyone knows, leave a comment below. Despite neither having a legitimate age barometer, I found Kentucky Pure XO smoother than Kentucky Vintage bourbon by far – despite claims that Kentucky Vintage is aged older. You would think that the lower proof whiskey would be smoother, but not at all. Even at 107 degrees of heat, Pure Kentucky XO comes out on top. The burn is a notable feature for both of these bourbons, but again, Pure Kentucky XO comes out on top. There is just something a little awkward about Kentucky Vintage – it almost seems like all burn and no body. A few drops of water mellows out the bourbon, but I would rather have something that I can drink without having to add anything to it. Maybe using Kentucky Vintage in an Old Fashioned would be a good thing. In terms of flavor, Kentucky Vintage is subtle and complex. Takes some paying attention to pick up vanilla and old wood – could even be leather that I am tasting. Pure Kentucky XO is distinctly different. All the flavors that you expect from a bourbon – oak, toffee from the mingling of the corn and barrel char, and rye spice – are here. What makes Pure Kentucky XO stand out is the incredible smoothness of the bourbon. Finally, the finishing acts: Pure Kentucky XO produces a long, sweet, floral finish that meets the needs of any and every decent bourbon drinker. But if I had to make a choice, Kentucky Vintage bourbon wins. While there is a long burn that accompanied the finish, the flavors are carried through the burn. It’s pretty obvious that Pure Kentucky comes out on top of this bourbon review and at $10 less than Kentucky Vintage at that! But, of course, you may have a whole different take on both of these bourbons! If you enjoyed this article, keep the conversation going! Leave your own bourbon reviews and tell us what you think.